Rumford Baking Powder's reaction is approximately 70% with moisture (or in the bowl) and the rest when heat is applied. 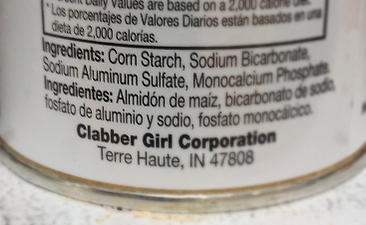 Clabber Girl's reaction is approximately 40% with moisture and the rest when heat is applied. Can anyone say what the chemical difference between the two is? Is there a practical difference between different brands of baking powder, or are they all formulated so that they function the same? It could be the case that the two baking powders are formulated so that Rumford and Clabber Girl release carbon dioxide in the same proportions in their first and second reactions. This seems possible to me. Is one of the purposes of filler to make sure that the amount of carbon dioxide per unit of baking powder is the same between different brands of baking powder? The ingredients are similar, but different ordering. That is significant. 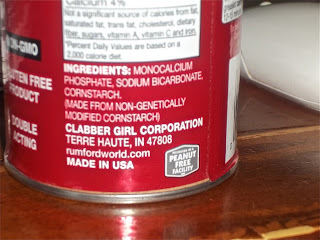 Also note that Clabber Girl brand has aluminum as an ingredient, Rumsford does not. In my home baking experience, the brands have been pretty similar. I opine that this is due to competitive and mature markets--you would want your product to be interchangeable with other brands. Few people want to retool recipes to accommodate a rogue baking powder. Maybe one of the professional bakers here has insights regarding characteristics of different brands. I believe that to be true. The fillers also prevent clumping or caking of the product. When I first read your Q, I went to look up regulations on Baking Powder content. I didn't find any in the US, which is unusual. Then it occurred to me: Baking Powder invention was well before vigorous food industry regulation. So each brand could do what they want, and still call it Baking Powder. Not the answer you're looking for? Browse other questions tagged baking baking-powder leavening or ask your own question.